Cannons were weapons of mass destruction deployed at the end of the Middle Ages. 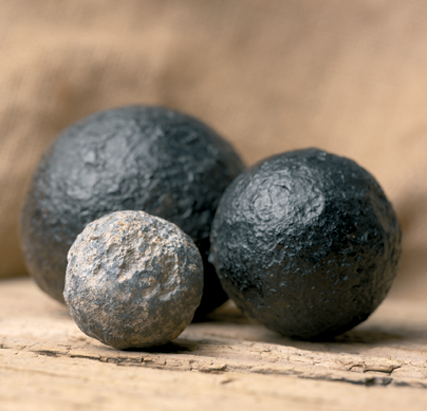 The cannon balls on display in our Museum were found at the site of a bloody battle at Smerwick on the Dingle peninsula. They are testimony to the Desmond Rebellion, a violent, large-scale military conflict that claimed the lives of thousands of people. Munster was devastated due to a ‘scorched earth’ policy deployed by both sides, Irish and English. Towns like Tralee, Dingle and Youghal were burnt to the ground, crops destroyed and cattle killed. In 1580, 800 English troops had surrounded rebels at Smerwick. After bombardment by heavy artillery the defenders signalled a truce but sadly all except 30 men were executed, including woman and children. These artefacts are currently on loan to Kerry County Museum from the National Museum of Ireland.